The Stags would like to welcome a new sponsor on board for 2018. Suttons Rosebery. They will generously donate $200 back to the club with every car sold to a club member / referral. Wanted - Under 9s players needed for our 2018 season. Under 9s players needed for our 2018 season. Current under 9 players if you bring a friend and they register you will receive a $30 Rebel voucher!!! There is also a ‘State of Origin Tour’ to the Gold Coast Queensland planned for our Mod teams (Under 9s, 10s & 11s) in July 2018. 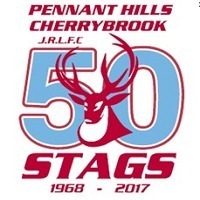 The Mighty Pennant Hills Cherrybrook Stags have turned 50 !! Calling all past and present players, coaches, helpers ans supporters. Come and join us for a quiet beer and an opportunity to share stories and catchup. The Stags are hosting a 50th year celebration evening on Saturday 20th May at 8pm at Pennant Hills Bowling Club. The night will include a show by Comedy for a cause, raffles, prizes and auctions. Tickets are only $35 per person so please click on link below to purchase your tickets now. Presenting our 50th season jersey with room for a major sponsor. Registration for 2017 Season is open. New and Returning Players can register On-line by clicking on the box to the right. The North Sydney Referees association is currently recruiting for referees for our 2017 competition. Please see attached flyer for anyone who is interested in becoming a referee. This year our Club Presentation has been generously sponsored by Nova at Peasy – Property, Easy. PRESENTATION DAY - will be held on 15th October at Millones Restaurant 43 Old Northern Rd BAULKHAM HILLS from 1-4pm. There will be a jumping castle, face painting, pizza, ice-cream and soft drink for the kids. Good luck to all our teams tomorrow playing at North Sydney Oval. We hope the weather holds up. Hope to see a lot of supporters there cheering on U9's, U12's and U14's who are all playing in Grand Finals. Best of luck. North Sydney July Holiday Cub clinic. This Holiday clinic will be held at Storey Park, Asquith. After a successful April School holiday clinic will again be running the North Sydney Holiday Cub Clinic in conjunction with the South Sydney Rabbitohs. All Coaches, Managers, Trainers and other Volunteers throughout our club must now register on line. If you are a COACH please Register Online and you will be taken to the appropriate registration form. The club will be holding a Registration Day on Sunday 14th February from 10:00am to 2:00pm at Greenway Oval. On August 13th 2010, Trooper Jason Brown was killed in the service of his country in Afghanistan. Jason Brown was a former player of The Stags, playing from under 6’s, through to our senior grades. Trial Game has been confirmed for all age groups U6 to U16. The Stags will be having trial games against Belrose on Sunday 20th March. All members are advised the 2015 Annual General Meeting will be held Tuesday 1st December 2015 at West Pennant Hills Sports Club at 7:15pm. Stags Presentation Day is Sunday 11/10/15. Time frame of 1pm to 4pm. Jumping Castle, Face Painting, Hot Dog machine, Fairy Floss machine, Popcorn machine, Slushie machine. A big thanks to the Season Draw Committee and Josh Hyland. NRL are running two holiday clinics that will be taking place within the North Sydney Junior League district in the upcoming July school holidays. A new President and Committee was appointed for 2015. Rees Leyshon is the new President. We thank Rees for making himself available. AT: Hotel Pennant Hills. Pennant Hills Rd. Pennant Hills. NRL Clinic these School Holidays on Tuesday the 15th of April at Greenway Park, Cherrybrook. The day will run from 10am to 1pm (rego’s commence at 9:15am) for Boys and Girls aged 5 to 12 years. The Stags defeated Narraweena 40 - 0 on Saturday. IS JUNIOR RUGBY LEAGUE SAFE? Well ... it's actually one of the safest sports at a junior particitation level according to research undertaken by Medibank Private in 2006. Sports such as AFL, Soccer, Cricket, Basketball and Netball all rated as being more prone to injury when compared to Rugby League with the research based on patient representations to Australian hospital emergency departments and general practices. Click to read more and get the facts. The Stags Photo Gallery is now being updated with some great photos from the 2010 season. Simply click on the 'Photo Gallery' link on the left hand menu pane to view our updated photos. Is British rugby league preparing for a revolution?